HUMPHREYS, SOUTH KOREA--Soldiers of the U.S. Army Medical Department Activity Korea, 65th Medical Brigade, 8th United States Army, U.S. Army Garrison Humphreys, civilians and family members gathered October 19, in front of building #6370 on U.S. Army Garrison Humphreys for a ceremony to memorialize the newest medical facility as the Sgt. 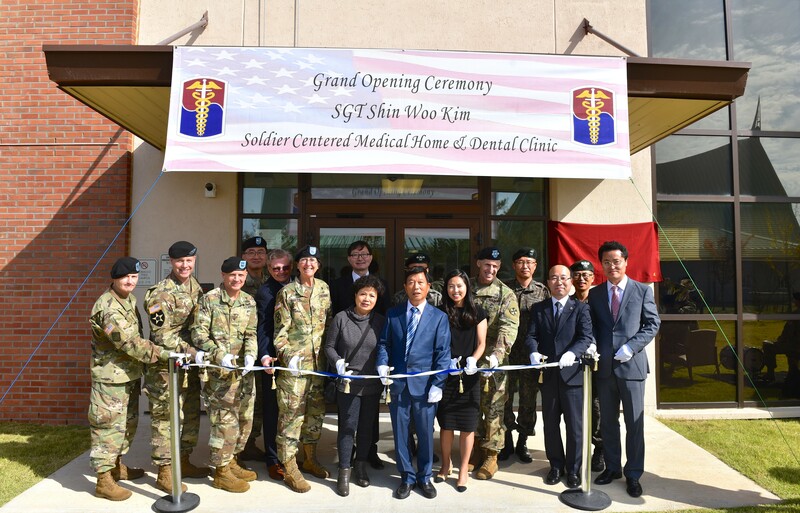 Shin Woo Kim Soldier Center Medical Home and Dental Clinic. Naming the clinic honors Kim, a combat medic assigned to 2nd Battalion, 12th Infantry Regiment, 2nd Brigade Combat Team, 2nd Infantry Division, for his actions in Iraq while providing treatment to an injured comrade. Born in Seoul, South Korea, Kim and his parents moved to the U.S. where he graduated from Sunny Hills High School in Fullerton, CA. Known for his great big smile, Kim enlisted in the Army and trained to be a combat medical specialist. On the night of June 28, 2007, while on a 15-month assignment in support of Operation Iraqi Freedom, Kim's platoon was struck by a deeply buried improvised explosive device and ambushed. As a trained combat medic, Kim rushed to aid and provide treatment to his fallen comrades while the insurgents lobbed grenades. One grenade landed next to him as he was treating his platoon sergeant. Without hesitation, Kim laid himself between the grenade taking the blast and saving the platoon sergeant's life but at the cost of his own life. He was awarded a Bronze Star Medal for his actions that day. Guest speaker of the ceremony, Lt. Gen. Thomas Vandal, 8th U.S. Army Commanding General, said, "We are grateful for the service and sacrifice of Sgt. Kim and are here to honor this fallen comrade who embodied selfless service to the nation and to the alliance. Today's dedication ceremony is indicative to the strides 8th Army has made in its transformation and relocation. No doubt the Kim clinic will provide world class care to our service members to ensure 8th Army remains ready to fight tonight." The General went on to expound on the values and traditions of today's military using Kim as a prime example reminding those present to remember the selfless sacrifice and actions represented by Kim. "It is through Sgt. Kim's selfless service, sacrifice and personal courage that his legacy will live on through this memorialization of a building dedicated miles from his birthplace that will continue to serve thousands of service members in the years to come," said Vandal. "My son left his name and I am proud and honored that the Army is remembering my son by naming this facility after him," said Kim. Col. Wendy Harter, 65th Medical Brigade commander commented that the new Sgt. 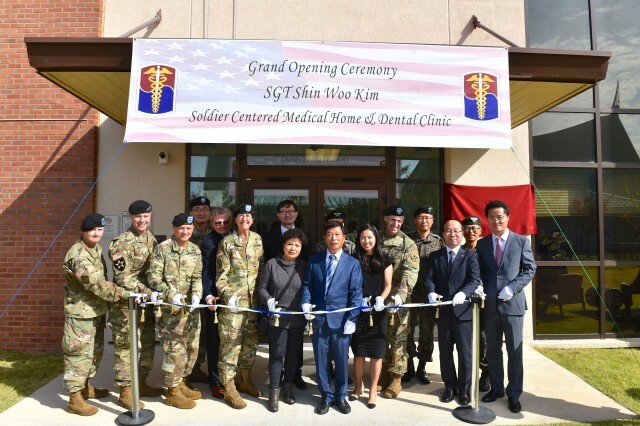 Shin Woo Kim Soldier Center Medical Home and Dental Clinic is a critical part of the capability of the medical system of Medical Activity Korea. 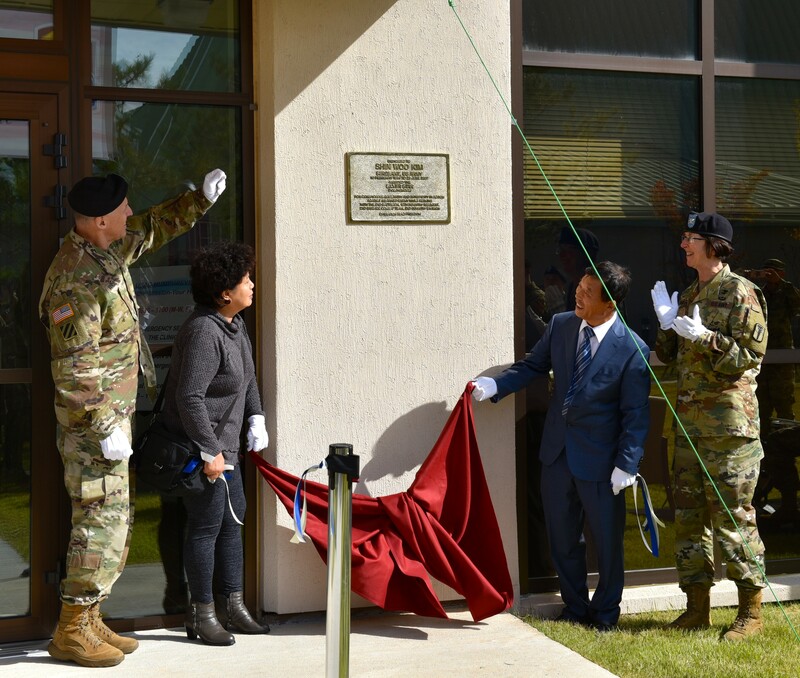 "Here in Pyeongtaek and Area III, we provide care for our warfighters and ensure that 8th Army is medically ready when called upon to 'Fight Tonight,' this remains our enduring mission," said Harter. 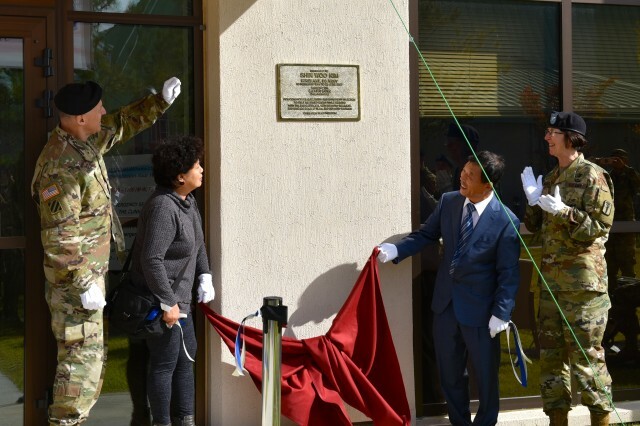 After the ceremony, those in attendance were given an opportunity to tour the new facility, which will provide primary medical and dental care services to the Soldiers stationed at U.S. Army Garrison-Humphreys.